Our scobberlotch blogger Beth, and fellow friend Nialah, were invited for an evening of fine dining at the beautiful Gusto restaurant along the Quayside. As typical baked bean eating, Heinz tomato soup loving students, to be invited to an evening of what promised decadence, divine and delicious food was definitely something to be excited about and Gusto did not fail to disappoint. We were greeted warmly and promptly escorted to our intimate booth, where we browsed the menu by the soft glow of fairy lights entwined around branches of olive trees. Our eyes filled with anticipation; this was going to be a good night. We felt like we’d been transported into a high-end soirée, the décor makes you feel surprisingly significant, but not out of place. An Italian restaurant, with sultry lighting and the murmuring of buzzing conversation – Gusto can transform an average meal out into something rather special. Having been blown away at the extensive and varied options on the menu, including a great selection of non-alcoholic cocktails and exploiting our new-found feeling of importance, we started the meal off with baked rosemary focaccia bread with olive oil and balsamic vinegar. After feeling like we’d been transported to the coast of the Mediterranean, with the warm bread and tangy oil almost melting int our hungry mouths, it was time for starters. 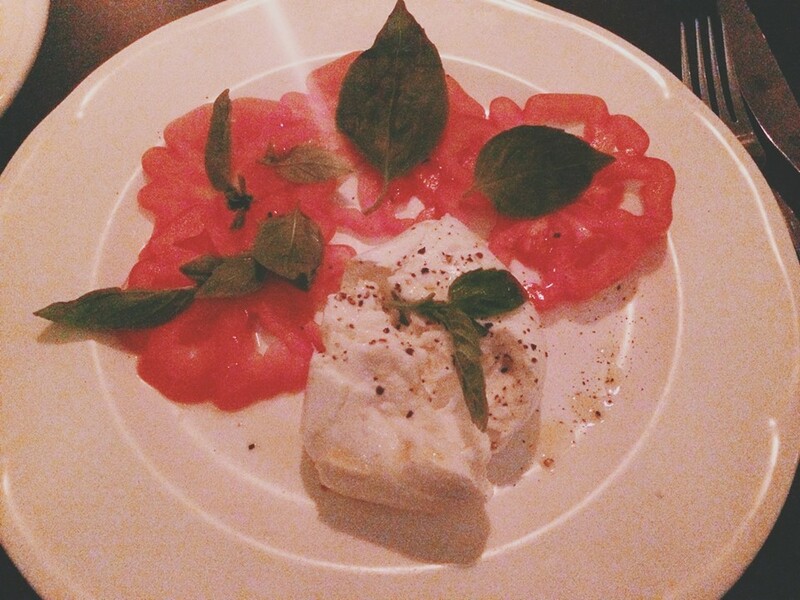 The burratina mozzarella, tomato and fresh basil salad was fantastically creamy and very Italian, however it was the creamed celeriac and chestnut soup with truffle oil and flashes of Pecorino cheese that won our hearts. It was like a hug from inside on a crisp spring evening. Gusto has fantastic meat and pizza options, truly a place that can accommodate a variety of tastes. However, I opted for the Rigatoni primavera, served with an array of vegetables and chicken and Nialah opted for the butternut squash risotto with fried sage, toasted almonds and truffle oil. 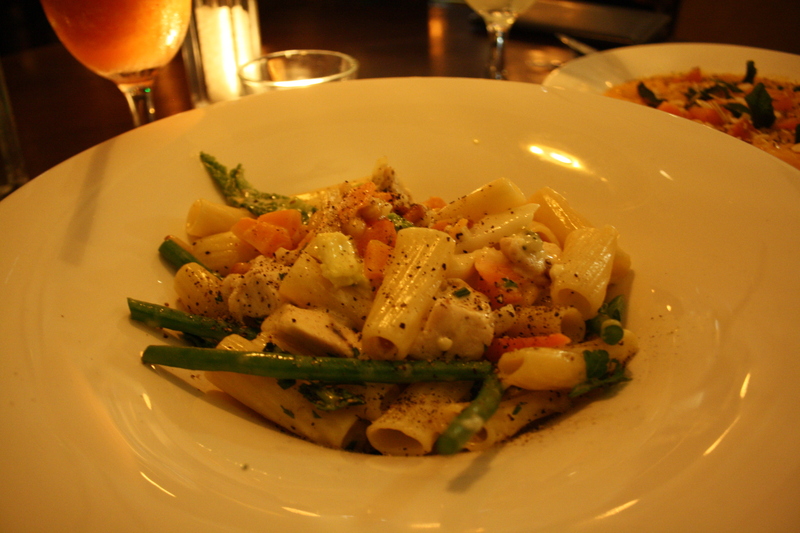 The Rigatoni was delightful, with fresh crisp greens and tender chicken covered in a creamy pine-nut speckled sauce. 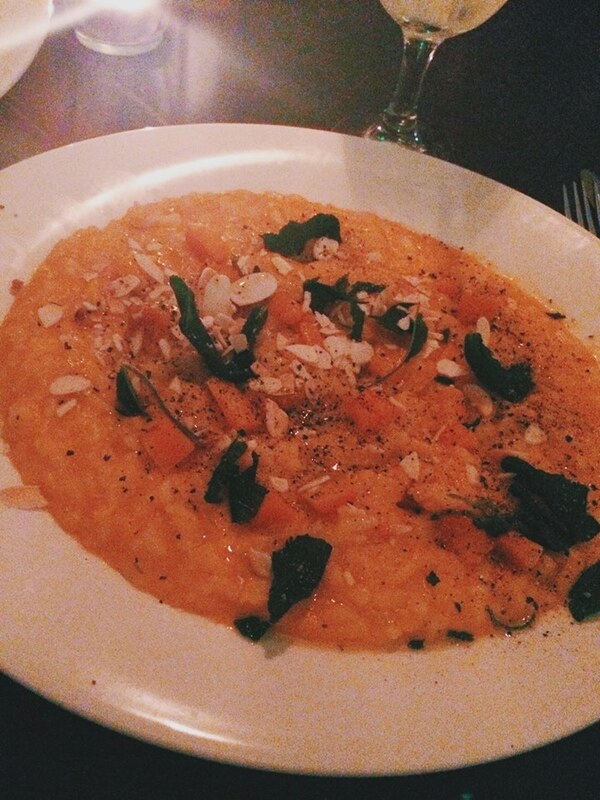 As for the risotto, oh it was scrummy and will be dreamed about for a few nights to come. It was richly filling, with the toasted almonds adding the perfect amount of crunch, the sage a depth of saltiness that triumphs over even the best brand of sea salt, and the truffle oil (a new venture) sealing the dish with a touch of luxury. Despite being very full (the portion sizes are generous) it was time for dessert which as any sensible person knows, cannot be denied. Nialah’s ten-year-old brother once told her, “There is always a separate stomach for pudding.”, so heeding his sound advice, we ordered the hot chocolate and hazelnut brownie (served with pistachio ice cream and chocolate sauce). It tasted as rich as it smelt, but was balanced by the scoop of ice cream. 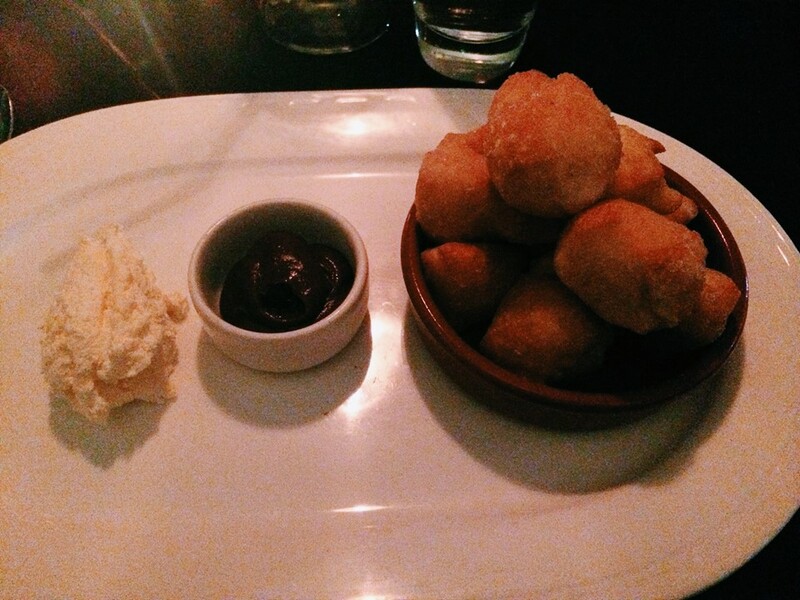 The bombolini (mini doughnuts) with chocolate sauce and cream were equally as satisfying. There’s just nothing like popping a whole ball of fried, sweet, wonderfulness coated in warm, molten chocolatey wonderfulness into your mouth and having a little wonderful explosion of wonderfulness. 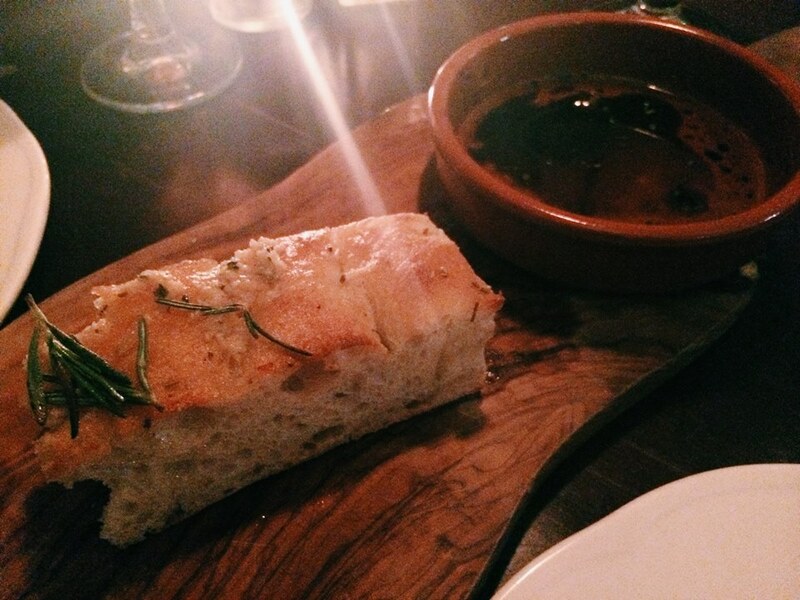 We have to say that we had an absolutely fantastic evening at Gusto. If you want to eat beautiful food in a beautiful location, without it costing the Earth, come to Gusto and you will be glad you did. We enjoyed every last mouthful and our protruding stomachs seem to agree too. Thank you Gusto for a wonderful night! 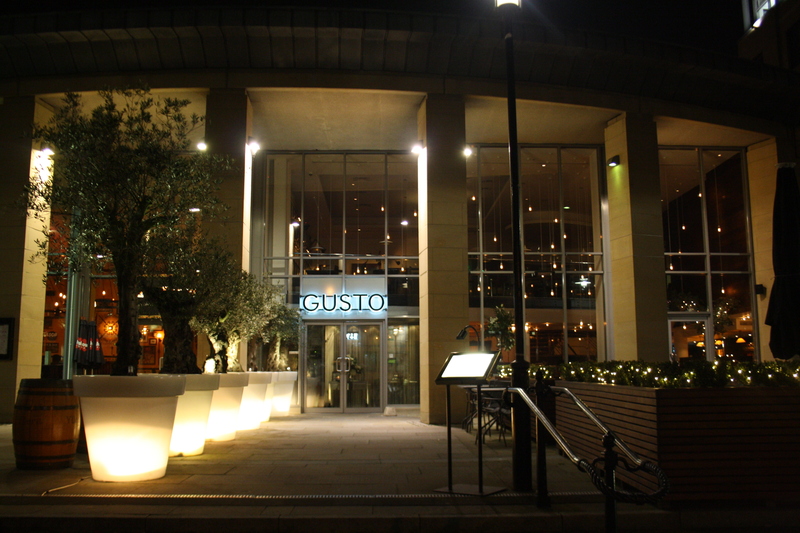 Gusto restaurant can be found on the Quayside (Newcastle-side), set just behind the Millennium Bridge and Pitcher & Piano. Check out their Facebook and Twitter pages too. Also, I highly recommend signing up for their mailing list as they have fantastic offers from time-to-time (hello 50% off in January! ), and they don’t bombard you with emails! I like the Seabass baked in sea salt and Italian herbs. That’s the only restaurant does it and does it well. 10 out of 10 from me.